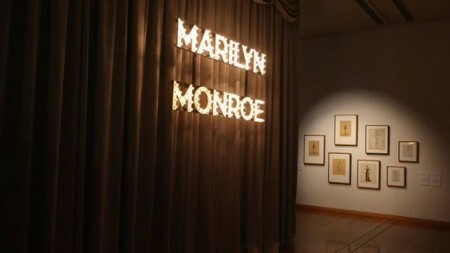 A new Marilyn Monroe exhibit opens at the Bendigo Art Gallery in Australia. She remains one of the most celebrated and enigmatic film stars in history, she transformed herself from ordinary girl next door, Norma Jeane Baker into a glamourous and universally-recognised screen goddess. 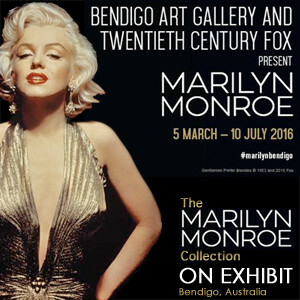 This comprehensive exhibition brings together authentic artefacts, clothing and other objects belonging to, or worn by Marilyn. More than 20 original film costumes from some of Marilyn’s greatest films such as Gentlemen Prefer Blondes, How to Marry a Millionaire and Love Nest feature alongside numerous dresses and accessories from Marilyn’s personal wardrobe. The ground-breaking collaboration with Twentieth Century Fox will allow unprecedented access to 12 of the films Marilyn completed with the studio, including glamorous studio portraits, wardrobe test photographs, lobby cards and film posters. Curated by Bendigo Art Gallery, the costumes, personal clothing and artefacts have been drawn from private collections around the world and have never been seen before in Australia. For exhibition photos, click here. Exhibition tickets can be purchased online.